"A job done once is a job done right." In my neverending quest for having fun with cards I never played before I stumbled upon miss Diego. Her cost-to-effectivness is awful, but who said you can't make a little combo around her? We usually treat this card as default economy option in HB decks, but it is neutral card after all and can be used by anyone! It works great with Simone and makes her efficient from turn one. And ta-dah, we have nice little remote server which can advance our Oaktown Renovation for free. Since it has BBG, Ash 2X3ZB9CY for defence will be also nice. You can go even futher and try to leverage Underway Renovation which is almost never worth spending real money on, but with credits from Diego, it can be fun to mill four runner cards while waiting for better agendas to happen. Put some GRNDL Refinery and Expo Grid for ultimate wackiness. It works, sometimes. Best used in Blue Sun: Powering the Future I think. So what’s the problem with Simone ? Expansive and must used twice to just break even. And that if she stays on the table long enough. 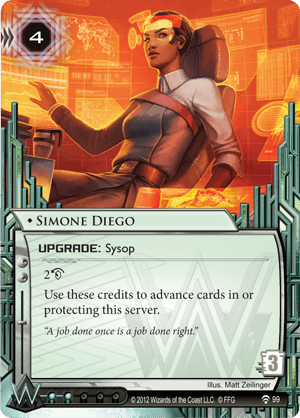 Space ices should have give her a chance, but seeing the deck she appears on this very site, she seems to have failed — well, based on the popularity of those deck rather than play-test ; maybe some are some hidden gems releasing all Simone’s power. Poor Simone. Yet a pretty lady, if you ask me.